The Ancestry Insider: Do Now? Disneyland AND Ancestry.com?!? Do Now? Disneyland AND Ancestry.com?!? Peyton Manning! You just won the 2007 "Best Championship Performance" ESPY! What are you going to do now?! "Hey! Look! I'm also going to Ancestry.com!" That's right. 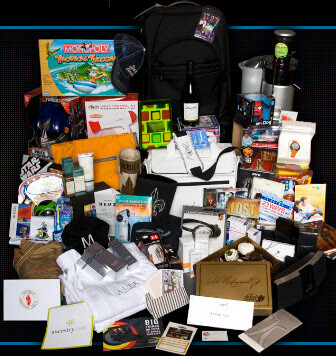 A careful perusal of the official ESPY gift bag given to participants in the ESPN Sunday night ceremonies earlier this week reveals an eclectic array of items, including a Disneyland Resort pass and an annual world deluxe subscription to Ancestry.com! Notice the Ancestry logo on the folder near the bottom left of the photograph below. There was no immediate word from Manning on which he would use first. Apparently the Disney/Ancestry co-branding is creeping into product demo videos for the new FTM software where they show Disney's family tree. Remember Ancestry.com's 1st DNA Project?